The connection between the pasties and the famous German baroque composer Johann Sebastian Bach (1685-1750) is tenuous; a few years after Susanna Eger had published her cookbook (in 1706), J.S. Bach accepted the situation of cantor in the Lutheran Thomaskirche in Leipzig. He would work there from 1723 until his death in 1750. It could well be that a copy of that cookbook was present in the Bach-household. 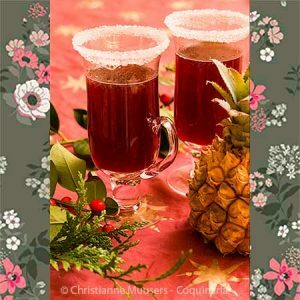 So prepare and serve this dish accompanied by secular cantatas of the great composer! On the left is a non-contemporary painting from T.E. 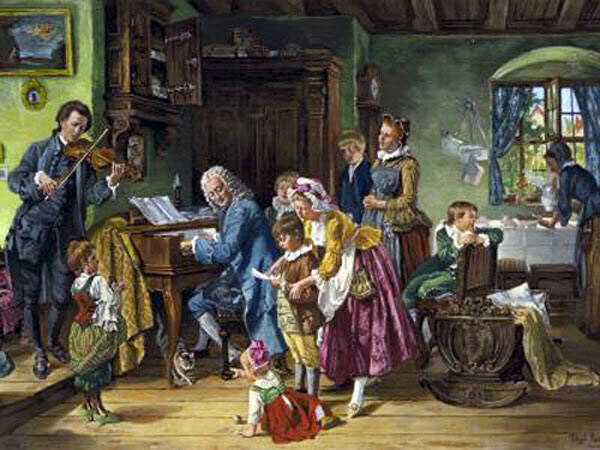 Rosenthal (1848-1917) from 1870, with the morning prayers of the Bach family as subject. In the background the breakfast table is being laid by a maid. (Stadtgeschichtliches Museum, Leipzig ). 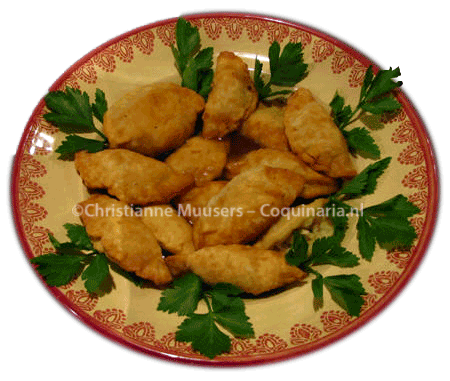 The recipe for these sweetbread-pasties originates from the Leipziger Koch-Buch, which was written by Susanna Eger (1640-1713). When Susanna was left a widow with four children, she became an independent cook who could be hired for special meals and feasts. 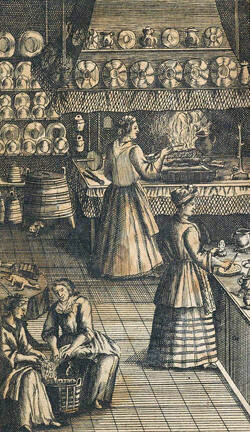 Her cookbook was first published in 1706. In 1715, Amaranthes wrote in his Frauenzimmer-Lexikon: “die Egerin” was “ein in der Koch-Kunst wohl-erfahrenes und geschicktes Weib” (Ms Eger was an able and experienced woman with regard to the culinary art). Although Susanna, in the first edition only known as S.E., claims in the introduction to her cookbook that the content is completely original, she has borrowed heavily from older cookbooks. In this she is not unique, this was a widely spread practice. According to Manfred Lemmer, the editor of the facsimile edition, some of Eger’s recipes can even be traced back, through several sources, to the fifteenth century. In 1712 and 1745 the cookbook saw new editions, the last one was used for the facsimile-edition from 2006. Since the later editions were ‘extended and improved’, and I have only seen the facsimile 1745 edition, I do not know yet whether this recipe was already present in the first edition. The cookery book has no less than 900 recipes. On the right is a pictur of the fromtispiece of the Kochbuch, and here follows a description of the content. The book opens with soups, but lacks a basic recipe for stock. The book continues with boiled dishes (fowl, meat, offal, but some of these dishes are fried before serving), and forcemeat balls (Klösser) of meat, fish, cheese, vegetables, grains, and sausages. Next are some recipes for vegetables, for offal, and brawn/jelly, eggs and fish. Then there are recipes for roast meat and sauces, salads, side dishes for the main meal (mush, porridge, blancmange, vegetables), and evening meal (again mush, dishes with fruit). These are followed by baked dishes: pasties, dough, pies, cookies, pancakes, fruit, marzipan, bread. Then confectionery, drying of food, sweets, quinces. There is a separate division on how to keep fruit and vegetables, making mustard and vinegar, pickling and smoking, wine and beer, and some ‘table jokes’ like a fire-spitting pig’s head and meat with fake maggots. The last chapter before the recipe index consists of thirty Curieuse Tisch-fragen (‘curious table questions’) about food and health, like: “Which meal should be most nutritious?” Answer: ” Ancient Greeks and Romans ate light on midday, the main meal was in the evening, but these days it is the other way around”. After the index of recipes -in which recipes 868-889 are missing- the book continues with the Curieuses Tisch- und Speise-Lexiocn [sic], an alphabetic overview of food and ingredients. The next appendix concerns a calculating help for the shopping cook: Die auf den Marckt zum Einkauf gehende geschickte und allzeit fertig-Rechnende Köchin. Super handy in a time before pocket calculators (unless you count the abacus). It offers multiplication tables from 1 to 10, and conversion tables for unit prices (if for example 1 chicken costs 3 Pfennige, you’ll have to pay 5 Groschen and 6 Pfennige for 22 chickens), a list of Leipziger measures (1 Wispel -an old measure for wheat- equals 2 Malter, but in Hannover for example 1 Wispel equals 6 Malter). (On the picture is the frontispiece of the Leipziger Kochbuch). Finally at the end of the book there is a kitchen inventory, with the objects ordered according to the material they are made of: tin, plate, iron, wood, earthenware, porcelain and linen. A separate leaf shows ways to lay oblong, round and square tables, with indications of the dishes that should be on the table. By the way, Susanna also offers two holländische (Dutch) recipes in her cookbook, for stockfish with rice (recipe #304), and for a beef sausage with lard that is pickled raw and will keep from 29 September (Michaelis) until May (recipe #879). Ravioli, raffiolen, roffioelen, or simply pasties? The German recipe is for Raffiolen. There are recipes for ravioli as early as the fifteenth century, and not just in Italian cookery books. Ravioli are small, stuffed dumplings that can be boiled, fried or baked. This pasta recipe from the sixteenth century certainly looks Italian, not surprisingly it is from an Italian cookbook. But the recipe on this page and the recipe for Roffioelen with fish from the fifteenth century that will be published in the future, have more in common with pasties or samosas. Leipzicher Kochbuch, edition 1745 (facsimile-edition 2006, see bibliography) p.60/61. Raffiolen zu machen, erstlich von Brößgen und Hüner-Brust. Nimm Brößgen, darnach du viel machen wilst, koche sie nicht gar zu weich, dann hacke sie mit etwas gekochter Hüner-Brust und Marck, doch nicht gar zu klein, thue ein wenig Rindfleisch-Fet in einen Tiegel, röste gehackte Petersilie und geriebene Semmel darinn, thue das Gehackte dazu, nebst ein wenig Salz, Würze und einem Ey, rühre es unter einander, laß es auf einer warmen Stelle stehen. Denn thue schön Mehl in eine Schüssel, schneide kleine Stückgen Butter und knete sie darunter, querle zwey Eyer in ein Töpfgen, darnach du viel Teig hast; gieß sachte zu, und rühre es mit einem Rühr-Löffel recht unter einander, mit ein wenig Salz, streue Mehl auf ein Bret, thue den Teig heraus, würcke ihn, daß er nicht mehr an Händen klebe, mandele ihn fein dünne auf, lege dann von dem Gehackten darauf, Häufgen wie ein Kloß, etliche nach einander; jedoch daß allemahl ein wenig Plaz darzwischen bleibe. Schlage den Teig darüber, formire es wie einen halben Monden, rädele den Teig um jedes ab, doch nicht zu genau. 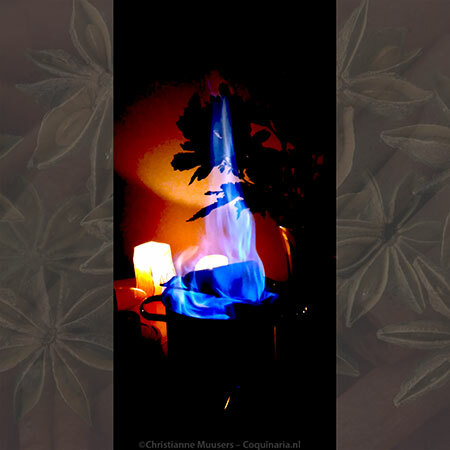 Wenn sie nun alle gemacht, so backe sie in heiß geschmelzter Butter fein gelbe, lege sie in eine Schüssel, seze Rindfleisch-Brühe zum Feuer, thue ein gut Stück Butter darein, auch Muscatenblumen, querle es, gieß auf die Raffiolen, und laß es auf einem Kohl-Feuer aufkochen. Du kanst sie auch warm trocken essen. To make ‘ravioli’, first of all from sweetbread and breast of chicken. Take sweetbreads, according to the amount you want to prepare. Do not boil them too tender (soft? ), then chop them with some cooked chicken breast and marrow fat, but not too small. Put some beef fat in a skillet, fry chopped parsley and bread crumbs in it, add the chopped [meat] with some salt, herbs and an egg. Mix well and keep it in a warm spot. Then put good flour in a bowl, cut two pieces of butter and knead them with [the flour]. Beat two eggs in a small bowl, depending on how much dough you have. Pour slowly in the bowl, and stir it with a stirring-spoon well together, with a little salt. Sprinkle flour on a board, put the dough out (=of the bowl on the board), work it until it does not stick to the hands anymore, and roll out thinly. Then place the stuffing on it, heaps like a small forcemeat ball, many next to each other but with a little space between them. Fold the dough over, shape it as a half moon and cut the dough with a tracing wheel (?) around each, but not too precisely. When they are all made, fry them in hot melted butter nicely yellow and put them in a dish. Put beef stock on the fire, add a nice piece of butter to it, also mace, stir it and pour over the pasties. Bring to the boil on a coal fire. You can also eat them warm and dry. Although the name of the dish calls a pasta dish to mind, in fact it has more in common with Indian samosas. In the original recipe the pasties are not boiled, but almost deep-fried in hot butter. You’ll have to use clarified butter for this, otherwise the butter will burn. Clarifying butter is quite easy to do (see here). If you do not mind deviating from the historical recipe, you can also use oil to deep-fry the pasties. Een borrelhap (droog) of voorgerecht (met bouillon) voor 6 tot 10 personen; voorbereiding 45 minuten; bereiding 40 minuten. Stuffing – Prepare the sweetbread: steep in salted water for fifteen minutes, rinse, and remove the outer membranes. Put on the fire in cold water, heat it until almost boiling, and poach the sweetbreads for twenty minutes. Poach the chicken breast as well (ten to twelve minutes). Take the marrow from the bone (here is how to do this). Melt suet or butter, fry parsley and bread crumbs. Put this in a bowl and mix in meat and egg. Add salt, pepper and nutmeg and keep covered until making the pasties. Not in a warm place as the original recipe instructs, but in the refrigerator. Dough – Cut the butter with two knives in the flour into small pieces. Add the eggs with a pinch of salt, and mix and knead into an elastic dough ball. If the dough stays too dry, add a little water. If it is too wet, add a little flour. Cover and leave the dough to rest for a half hour. Make the pasties – You can make them several hours in advance, and keep the pasties in the refrigerator until frying. Sprinkle flour on the worktop and roll out the dough in a thin sheet. Cover one half of the sheet with small heaps of stuffing, fold over the empty half of the dough sheet and press the two layers together between the stuffing. You can also use a dim sum-mould to make the pasties (see picture). I used a medium sized one, with a diameter of 9.5 cm/3.75 inch. Whichever method you use, take care that the edges are carefully pressed together. 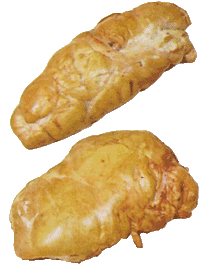 Fry the pasties – Heat clarified butter in a small skillet to 160 °C/320 °F. Bake two or three pasties a time for a few minutes until golden brown. Drain them on paper towels and then keep them warm in an oven at 120 °C/250 °F while baking the remaining pasties. When serving the pasties in stock, heat this with a piece of mace, and let a piece of butter melt in it. Or not of course, as there is already an amount of butter used in the dough and the stuffing, plus the pasties are fried in butter. If you want to make a leaner version, you can wrap the stuffing in Italian pasta dough, and boil the ravioli (because that is what you are now preparing) first in water and then serve in the stock. See the recipe for Ravioli with quail. The pasties are at their best when they are served straight after frying. Dry – Cover a dish or individual plates with an elegantly folded napkin, place the pasties on the napkin and garnish with (fried) parsley. Served this way, the pasties can be eaten as finger food. In broth – Pour hot beef broth in soup plates and add some pasties. Served this way, it is better to use cutlery. Early eighteenth century most people already used forks and knives, but some people still preferred (or were used) to eat with their fingers. ‘The soft, nutritious substance found in the internal cavities of animal bones, especially the shin bones of oxen and calves’ (The Oxford Companion to Food). It used to be a delicacy, but now it is looked upon with suspicion (BSE, cholesterol). This distrust and repulsion is not justified. Bone marrow contains iron, phosphorus, vitamin A, and contains 75% monounsaturated fat which is believed (though not yet proven beyond a doubt) to reduce the risk of heart disease and even some cancers. Since the shin bone is not connected to the brain or spine, there is no risk of BSE. Before using bone marrow, you have to prepare it. The bones have to soak for at least twelve hours in salted water which has to be refreshed several times. You’ll see the water turn pink from the blood that is extracted from the bone marrow by the salted water. After soaking rinse the bones and pat them dry. Bone marrow can be prepared in to fashions: you can boil them or roast them. If you boil them, fifteen minutes is enough. Roasting takes about as much (or little) time, in a preheated oven of 225-240 °C/435-465 °F. Just place the bones upright in a greased baking tray. When the bones are done, they are served on a plate with a special marrow spoon. The marrow is scooped out of the bones, spread on freshly toasted bread and sprinkled with salt. The marrow spoon dates from around 1700, when serving roasted marrow bones was quite popular. The spoon can be used at both sides, for narrow and wider marrow bones. Preparation: Sweetbread must be prepared as freshly as possible. First steep them in cold salted water, about one hour. Refresh the water a few times. Then bring to the boil with fresh water with salt, and take the sweetbreads out as soon as the water boils. Rinse them under the cold tap. Remove membranes and hard pieces. To make sweetbread firmer, you can now keep it under light pressure for an hour, allowing the excess moisture to drain away. This is especially advisable if you want to fry (breaded) sweetbread. Susanna Eger, Leipziger Kochbuch von 1745. Edition Leipzig, 2006 (1984? ), with an epilogue by Manfred Lemmer. Peter Peter, Kulturgeschichte der Deutschen Küche, München, 2008.